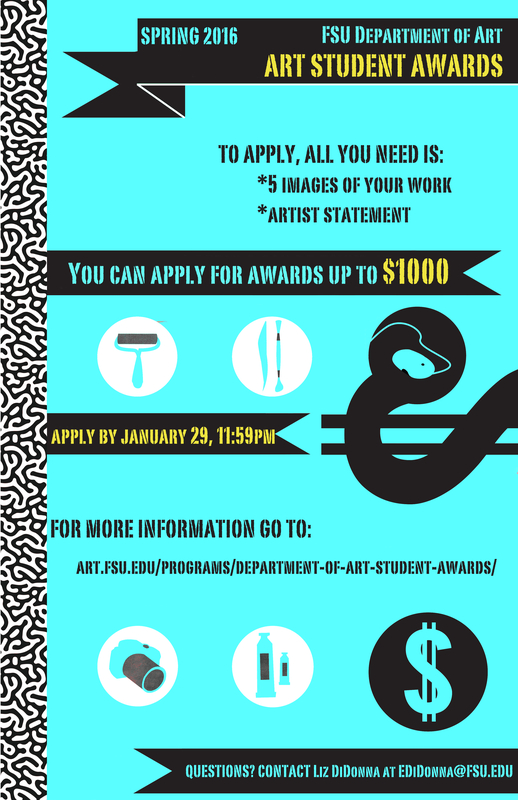 The FSU Department of Art announces the 2016 Art Student Awards. These awards recognize the strength of our students and that means YOU! You may self-nominate for any award category that you feel is an appropriate fit for your creative research. There are many different award categories available and each award comes with a monetary prize. We strongly encourage you to apply for as many of these awards as you feel are a good fit for your work. The list of awards with descriptions can be found at the bottom of this email and is on the Department website. As long as you have good images of your artwork, the application should be very easy. We hope that you will consider applying for at least one award category. To submit your work, go to the following link and click on “Apply” next to the award you want. For each award you apply for, you may upload 5 images of your work. If you are applying for more than one award, you can choose to use the same images for each or submit different images based on the award description. Note: you must complete each award application separately and upload your images and information for each individually. Max image size is 2MB, Accepted file types: pdf, jpg, jpeg, png, gif. For videos or animation, please do not attempt to upload the video and instead provide a link to the work online (i.e. Youtube or Vimeo). Choose ONLY awards you are eligible for (BA/BFA/MFA), that are the appropriate medium (i.e. apply with photographs for the Photography award), and that you feel are a good fit for your work. Applications that do not fit the criteria will be discarded. Given to one graduate (MFA) art student demonstrating significant achievement in studio art. Given to an outstanding student (BA, BFA or MFA) for work of exceptional artistic achievement in Painting and Drawing. Given to an outstanding student (BA/BFA) for work of exceptional artistic achievement in Foundations coursework (2D Foundations, 3D Foundations, Digital Imaging Foundations, Drawing Foundations).